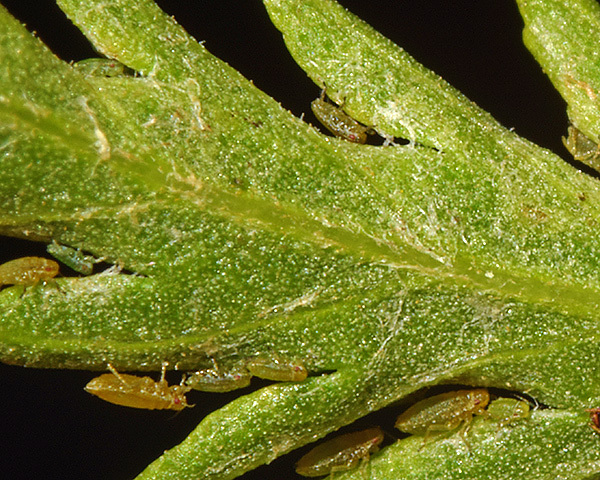 Coloradoa are small green or reddish globose (globe-shaped) aphids. They have a very convex frons with no antennal tubercles. Their antennae are always shorter than the body, and the terminal process is always longer than the base of the last antennal segment. The dorsal body hairs are short or very short and are expanded at the tip. The apical rostral segment is acutely pointed with concave sides. The siphunculi vary in size and shape. There are 29 species of Coloradoa worldwide. They feed without host alternation on members of the tribe Anthemideae in the aster family (Asteraceae). Males are usually small and apterous. 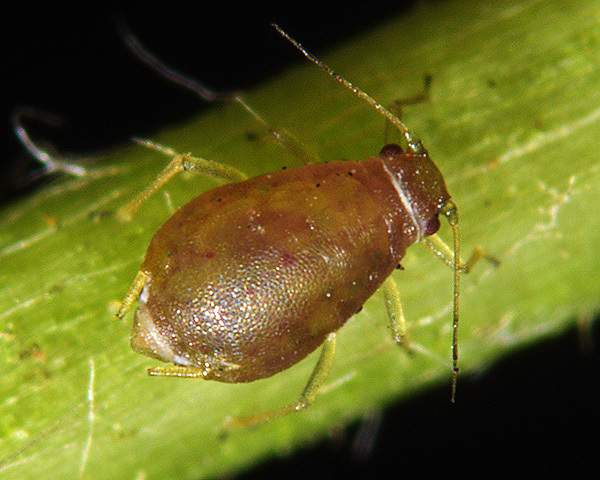 Adult viviparous apterae of Coloradoa achilleae are small oval aphids, coloured pale green to greyish green or reddish (see pictures below). The tips of the antennae and the tarsi are dark. The antennal terminal process is 1.1-1.4 times longer than the base of the sixth abdominal segment. The siphunculi are 1.3-1.8 times the length of the cauda. The siphunculi are near cylindrical, or with a weakly swollen apical part, and a well developed flange. The cauda is obtuse (=not pointed), slightly constricted at the base and with 5 hairs. Alate Coloradoa achilleae viviparae (not shown here) have pale marginal sclerites, rather pale siphunculi and a dark or pale cauda. Coloradoa achilleae is a small, inconspicuous species that can be found feeding on yarrow (Achillea millefolium) especially on leaves at the base of the stem. Their overwintering eggs hatch in late spring, but there is no information available on the population trends of this species through the year. 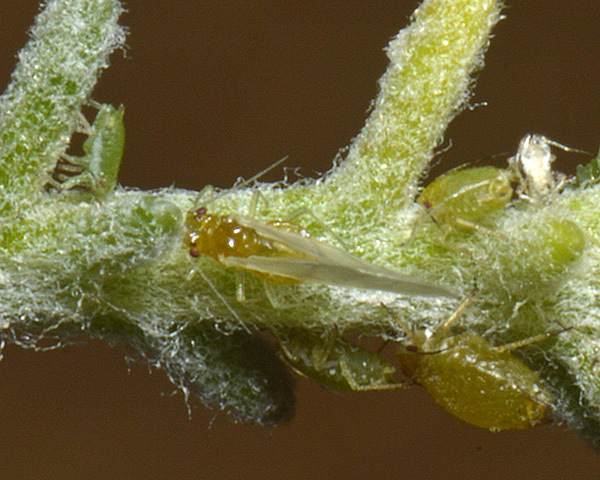 Sexual forms develop in autumn, with eggs laid at the base of the host plant. The small yarrow aphid is found in Britain, and throughout Europe into Russia, as well as having been introduced into USA. 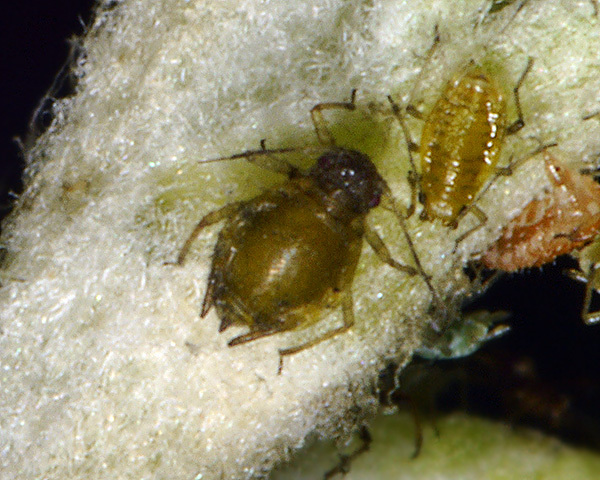 Adult apterae of Coloradoa bournieri (see first picture below) are pale or dirty green with dark apices to the appendages. The terminal process of the sixth antennal segment is quite short being 1.2-1.5 times the length of the base of that segment. The fused last two rostral segments (RIV+V) are 1.2 to 1.5 times longer than the second segment of the hind tarsus (HTII) (cf. Coloradoa absinthii, which has the fused last two rostral segments shorter than the second segment of the hind tarsus). Their siphunculi are clearly swollen and curved outwards towards apices, with the swelling asymmetrical and greatest on inner side (see micrograph below) (cf. most other Coloradoa species where siphunculi are cylindrical or only weakly and symmetrically swollen. The body length of Coloradoa bournieri aptera is 1.1-1.5 mm. The alate (second picture above) has 8-14 secondary rhinaria on antennal segment three, 4-8 on segment four and 0-4 on segment 5. Coloradoa bournieri feeds on cotton lavender (Santolina chamaecyparissus) and green cotton lavender (Santolina viridis). No sexual forms are known and the species breeds parthenogenetically through the year. 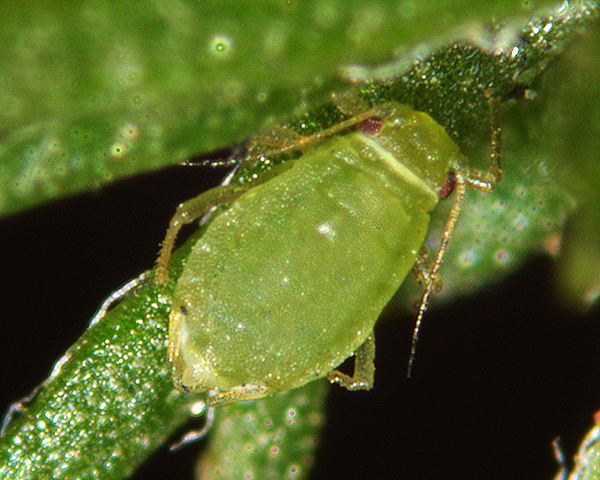 The cotton lavender aphid is indigenous to Mediterranean Europe and the Middle East where its host plant occurs naturally. It has now been found in Britain, and Argentina (coll. Durante, 2009). Our observations are the third record of Coloradoa bournieri in UK to date. Adult apterae of Coloradoa tanacetina are yellowish green or greenish yellow-brown, with the tips of the antennae and tarsi dark. The antennal terminal process is 1.4-2.0 times longer than the base of antennal segment 6. The last two fused segments of the rostrum (RIV+V) are 0.9-1.0 times longer than the second hind tarsal segment The longest hairs on abdominal tergite 8 are only 14-24 μm. The siphunculi are cylindrical and 1.3-2.2 times longer than the cauda. The length of the adult aptera of Coloradoa tanacetina is 1.1-2.0 mm. Winged forms (not shown) have 9-15 secondary rhinaria on antennal segment 3, 5-11 on segment 4 and 1-9 on segment 5. Coloradoa tanacetina feed in the indentations at the leaf margins of tansy (Tanacetum vulgare). 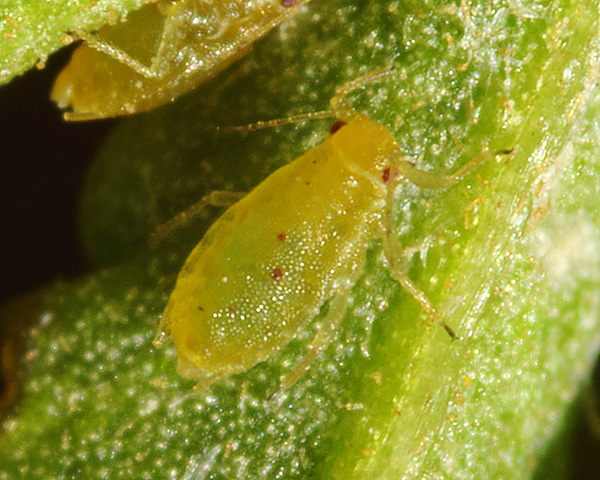 Sexual forms of the aphid (pale green oviparae and very small orange-yellow males) occur in September and October. Coloradoa tanacetina are found across northern Europe, and have been introduced to USA.